I spent the first day of my weekend etching workshop at Trefeglwys Print Studio developing a mezzotint plate. With two other printmakers, I worked until quite late and got up early ready for day 2. I was ready to print the first state – which is the very first print off a plate, to see whether it’s ready to go or if it needs more work. Advised by Trefeglwys printmaker Andrew Baldwin, I used Charbonnel black etching ink onto Somerset paper, soaked for about half an hour. The print is nearly there ….. I need to strengthen the light tones around the head of the Mari Lwyd and do more work into the copper plate on the feet, which have all but disappeared. The tones on the clothing need to be lightened too, with a scraper and burnisher. It’s surprising how dark the image still is, despite looking quite light on the copper plate. After a bit of a break for Xmas and too much good food and gallivanting, it’s head down for a bit more serious work. I’m carrying on with my series of small drawings from photos taken in the old church recently, using the simplest of materials, white conte crayon into an A4 Daler Rowney ‘Ebony’ sketchbook. I’m trying to explore atmospheric mark making and get out of my comfort zone, which is a fine pen into a little sketchbook. These drawings emphasise chiaroscuro and I hope they’ll eventually lead to some more finished work in manier noir style drawings or even some mezzotints. These interiors remind me a bit of German Expressionist film sets, one of my favourite periods of art and printmaking. Yesterday I drew a nook in the old church and today I drew a cranny. I was lucky enough to be able to take some photographs in an early 20th century church a couple of weeks ago and I’ve been drawing from them using white conte crayon into my Daler Rowney Ebony sketchbook. It’s pulling me away from my usual reliance on fine, detailed line and into intangibles, atmospheres and emotions. I’m so enjoying it and getting ideas for manier noir drawings and mezzotint etchings. I’ll be doing a lot more of these sketches I think, I’m finding it very stimulating. I spent some time in my studio today, starting a ‘manier noir’ style drawing. 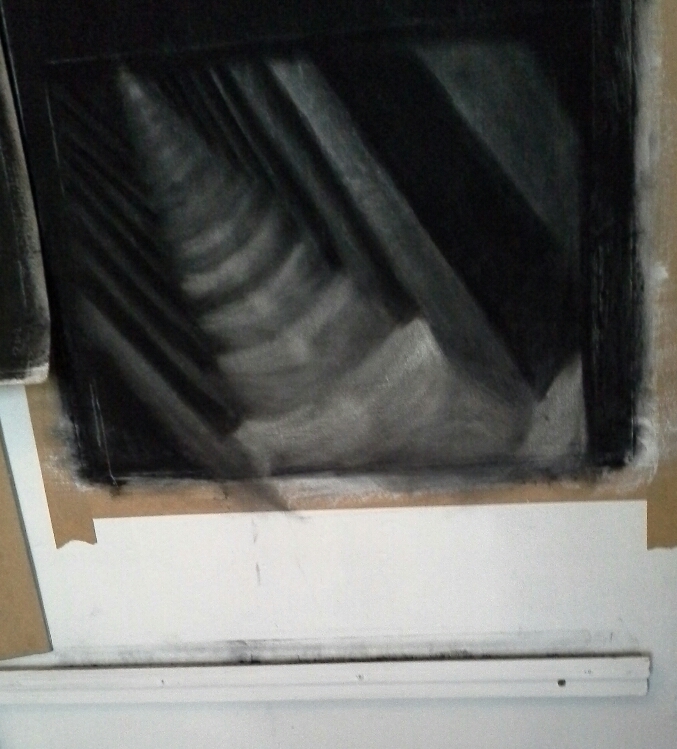 It’s a type of reductive drawing, working from black to white, rubbing away areas of charcoal to reveal the highlights. It’s the very first of a substantial body of drawings and original prints I have planned. I prepared Fabriano Accademica paper with gesso and when it dried, I rubbed it evenly all over with compressed charcoal, using my hand to get a smooth black surface. I ‘draw’ into the charcoal with steel wool and very fine sandpaper. This technique results in a subtle but dramatic chiaroscuro. Manier noir is an alternative name for the printmaking technique mezzotint, where an engraved metal plate has the highlights smoothed away with a steel burnisher. 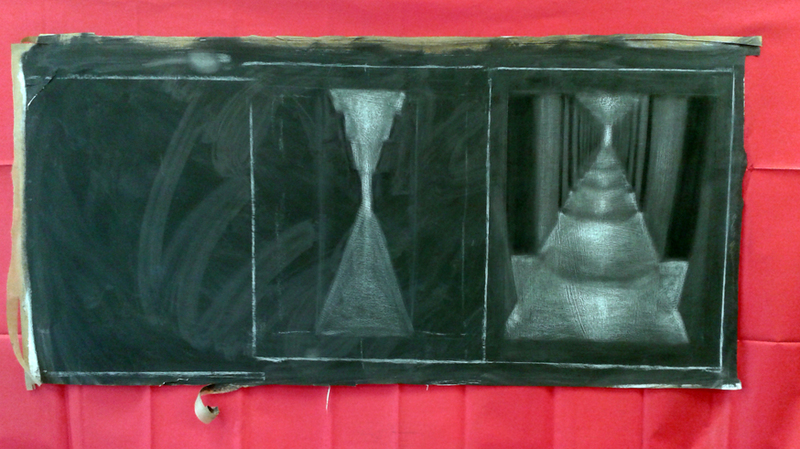 A fantastic printgeek blog about doing a mezzotint onto an aluminium plate from Nancy Farmer. Mezzotint on aluminium: Percy Cat.